Character house with about 500 m² of living space, courtyard, outbuildings, lots of potential ! Historic fully renovated house with 5 bedrooms, self-contained apartment, terrace and garden. Renovated winery with 5 bedrooms on a 1710 m² plot with pool and views. Sold fully furnished. Carcassonne is a truly impressive town and a magnet for visitors to the Languedoc Roussillon. The city features drawbridges, machicolations and an incredible 52 towers. It's no wonder Walt Disney based the castle in The Sleeping Beauty on this medieval city. It has a population of 47,000, although this number swells in the summer months when the city is packed with tourists taking in the city's unique atmosphere. The first two months of August are not to be missed as the City lights up for its renowned Medieval Festival. Carcassonne is, in fact, divided into two separate 'towns' ? Le Ville Basse and Le Cite. Both fascinating in their own respect. The latter is Europe's largest fortress and is an enchanting setting just waiting to be explored, no matter how old you may be. The city is situated in what was once a major trading route and so travelling to or from either by car or train is no problem. The Mediterranean Sea is an easy excursion. Those wishing to fly in, however, needn't worry. The city has it's own airport with regular flights to and from the UK. 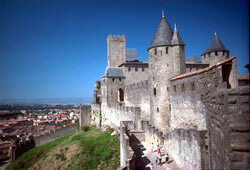 Carcassonne is a desirable region and property prices in the city are high. Those who still want the unique atmosphere of this city, but with a lower budget, should consider the numerous, reasonable properties located in the surrounding villages. Do you know Carcassonne better than we do? Do you have photos of Carcassonne? In the north west of the Aude department in the Languedoc-Roussillon. Economy: Tourism remains the backbone for the city's income. Interesting fact: Walt Disney used the town as the basis for the castle in 'The sleeping beauty'.